USMC Scorching Sands Assisted Opening Hawkbill Pocket Knife - G10 Handle - Officially Licensed | BUDK.com - Knives & Swords At The Lowest Prices! 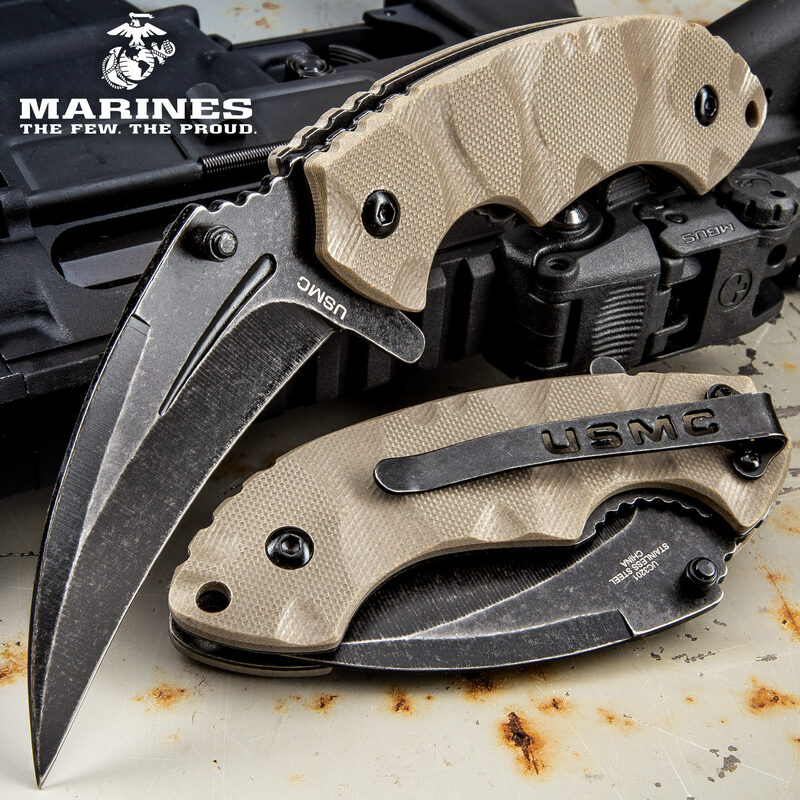 Versatile, potent and ready to conquer any challenge, the USMC Scorching Sands Hawkbill Pocket Knife easily earns its "USMC" moniker. Like a United States Marine, this fierce, officially licensed folder is always primed and ready for action, no matter how harsh the conditions or unfamiliar the territory. It boasts a savage, talon-like 3 1/4" hawkbill blade - forged from tough stainless steel enhanced with a rugged stonewashed finish. The edge is carefully honed to razor sharp, and the bitter point capably penetrates and slices through thick cowhide and other challenging materials as easily as an eagle ripping apart a fresh kill. Thanks to the advanced assisted opening mechanism, the blade deploys with incredible speed and grace. One-handed opening is easy via the ambidextrous thumb studs and handy blade spur. 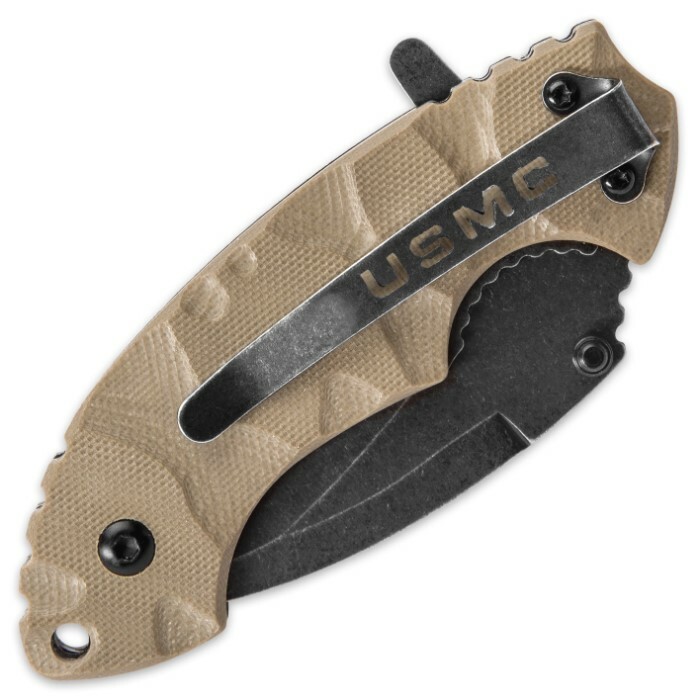 "USMC" is precision etched at the blade base. Ergonomically contoured and finely textured, the desert sand tan G10 handle always affords a sure grip, even in swampy, humid locales. At 4 1/8" long closed, the Scorching Sands Hawkbill is amply sized for everyday cutting jobs, rigorous field tasks and more, yet fits comfortably in jeans pockets. 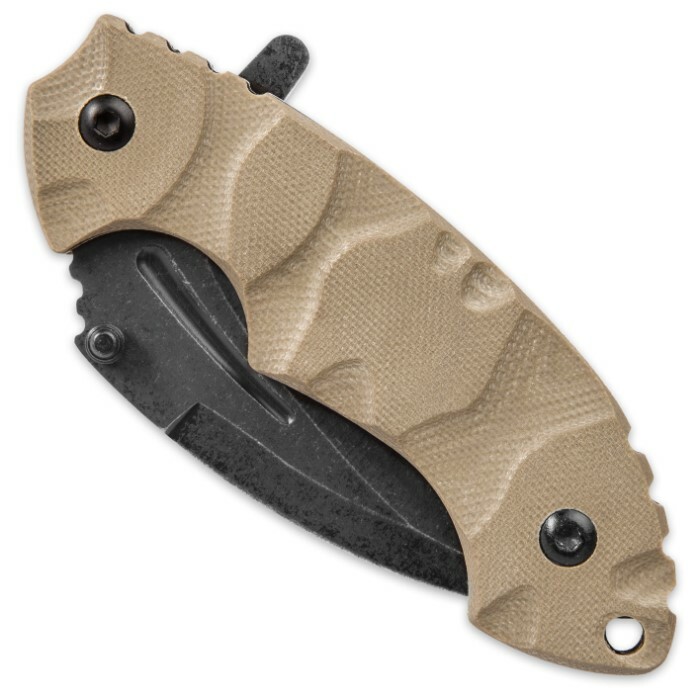 The built-in stonewashed pocket clip includes a cool "USMC" cutout, and the handle's integrated lanyard hole provides an additional carrying and/or tethering option. 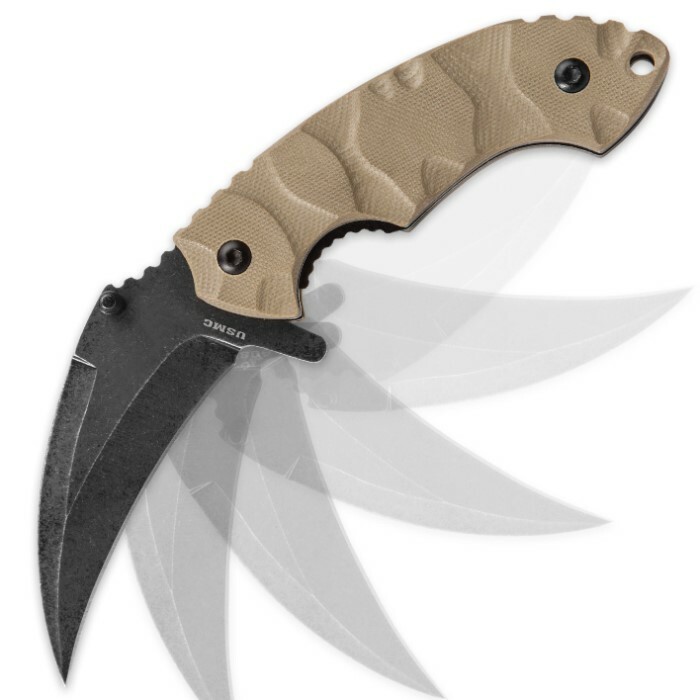 Use the officially licensed USMC Scorching Sands Hawkbill Assisted Opening Pocket Knife once, and you'll fall in love! And you won't find an officially licensed USMC hawkbill like this anywhere else, so look no further and order today! Cool blade but the screws holding the handle together stripped so the handle came apart. Until this happened this was my favorite knife.